This little plant is one of my favorite new finds,, and is a slightly different take on the everyday garden. Midori-san lives over in Kamakura (a very popular tourist destination that is well worth the trip from Tokyo) in Donburi Cafe Dining. What's so special about this little green (Midori is the Japanese word for "green") friend is that visitors can chat with her/him. Yup, that's right. 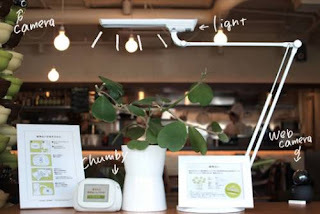 Midori-san fills diners in on the temperature, lighting, and humidity. But that's not all! Touch a leaf, and Midori-san will relay the chemical relationship between the two of you. Created by KAYAC Co. Ltd, and Keio University's Hiroya Tanaka Laboratory in order to increase awareness of the natural world, Midori-san also keeps a blog. (What modern plant wouldn't, for heaven's sake?) Blog readers can also treat Midori-san to a dose of light via a widget on the blog, which is, of course, much-appreciated. Image courtesty of KAYAC Co. Ltd.
That sounds amazing! Nothing like combining the best of reality entertainment, technology, and gardening! Can't wait to hear how your rice is doing. I'm ashamed to admit I don't even know what rice looks like when it grows. Isn't that terrible? This blog has lovely pictures. This post is a riot! Is this plant for real?? I want one! Rachel, don't be ashamed in the least! I had no idea myself until we came here, and even in America we ate it almost every day. It is, indeed, for real, Alexandra. What did you plant, and did different plants hum different tunes? I confess, I chatter to my plants in the garden (passers-by must think I'm mad! )all the time. I enjoy their company, so I hope they enjoy mine. So glad I found you through the Blogathon. The idea of a blog for a plant just blows my mind. Why didn't I think of that? Right? Sara, isn't that the truth? It's such a cool idea. Now, every plant I look at has me wondering what it would blog about if it could. Thanks for reading!